Earnest engineering. That’s what Dacias are about. That and, most famously, low prices. Forget premium-brand mark-ups or even the mark-ups of volume brands trading on history and extra sophistication. Instead, the Dacia formula, as most of us know, is about back-to-basics transportation. It’s a formula with considerable appeal. The Dacia Sandero, you may be surprised to hear, is the 12th best-selling car in Europe, and 100,000 Dacias have been sold in Britain since the brand’s 2013 relaunch. 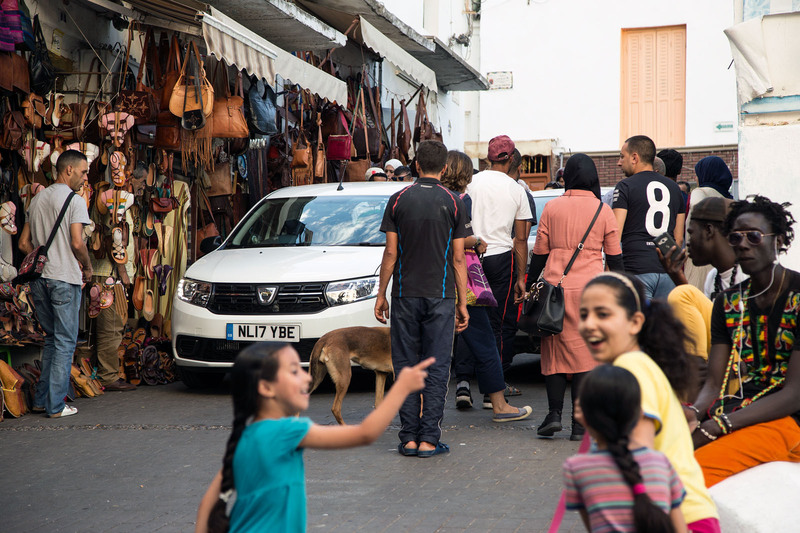 No-nonsense, budget cars have considerable appeal on other continents too: Dacia brand owner Renault has two plants in Morocco supplying not only Africa but export markets besides. Its ultra-modern Tangier operation builds the UK’s Sanderos. 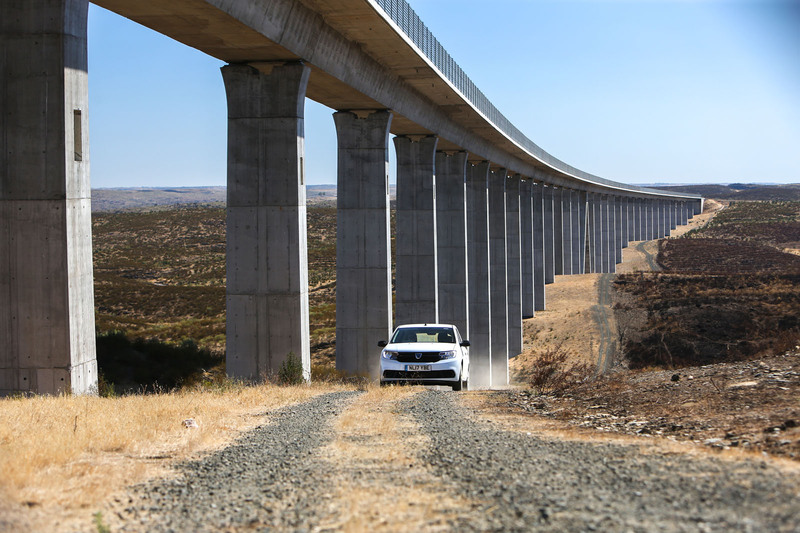 Opened in 2012, this plant recently finished its one-millionth vehicle. Which is why snapper Stan Papior and I plan to drive a Sandero 90 TCe Ambiance 1510 miles from Tangier’s Continental Hotel, a charming old portside hotel that mixes beautiful mosaic interiors with basic (but air- conditioned) rooms, to Autocar’s HQ in Twickenham. Our Sandero’s mid-range specification rather emulates the hotel room’s, what with its provision of the bare necessities plus chilled air, although you also get an unexpectedly sophisticated 898cc three-cylinder turbocharged engine, as widely shared with Renault, Nissan and Smart for economy of scale reasons. Industrial economics are a long way from our minds 20 minutes after touching down in Tangier. That’s because Papior’s cameras have been confiscated by a sympathetic but insistent Moroccan customs office, who need to see paperwork we were advised wouldn’t be necessary before his gear is released. You don’t need to know the tedious details beyond the fact that we spent long enough in Tangier airport to discover which of its two restaurants is better, that there’s a memorial to pioneering airman Pierre Jaladieu – violent turbulence flinging him from the open cockpit of his aircraft on 27 January 1928 while delivering mail to Tangier – and that there are several abandoned vehicles in the airport car park, including a UK-registered Porsche Cayenne with flattening tyres and an expired Kensington and Chelsea parking permit. We amuse ourselves by imagining the circumstances that caused it to be left there. After about 12 hours of waiting at the airport over the course of two days, the cameras are released by the apologetic woman running Tangier airport customs, aided by a (very effective) Renault fixer. No money changes hands, incidentally. We will meet another fixer later that night to negotiate customs at the ferry terminal for the cameras, our boat booked for 11.30pm. All of which means that we have only a couple of hours to shoot the Sandero in the city of its birth, in the souk close to the hotel, and on the seafront. Which is where the first of several Moroccans point out that our car is made in their county. It’s clearly a matter of pride, and rightly so. In fact, Renault has been making cars at its original Casablanca factory since 1966, with Dacias added there in 2005. So the breed is plentiful here, the rather odd Lodgy utility MPV making a fine taxi, as confirmed by a cabby who carries us in one. In the souk, which you must skirt to get to the hotel, the lanes are narrow, hilly and busy with people, so it requires a sub-3mph advance and a test of clutch control skills. The occasional shortfall, I slowly realise, is being compensated for by our Sandero’s engine management, which seems to have an anti-stall system, or something close to it. The combination of edging progress, hills and the air-con compressor randomly cutting in is a fine recipe for a cut-out, but it never seems to happen. Impressive. Last pictures shot under a sinking sun, we face a surprisingly long drive to the port, and one that becomes a lot more interesting as we free ourselves from Tangier. 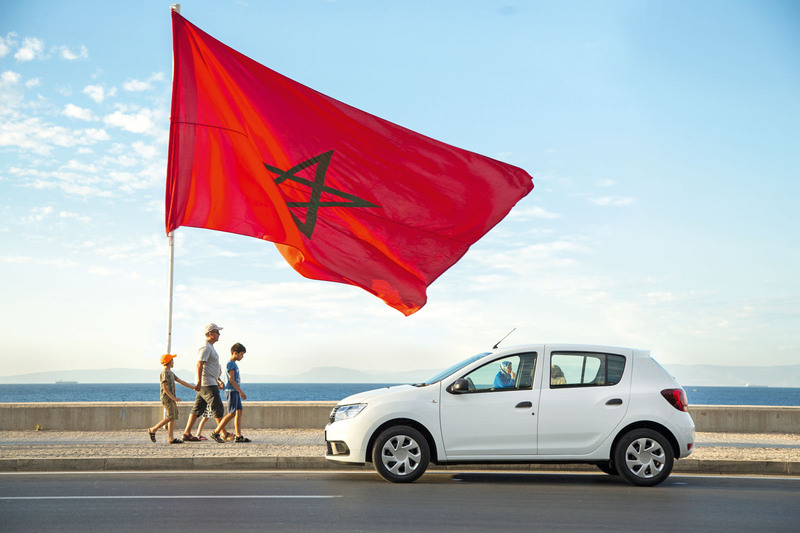 Moroccan driving is no more than mildly anarchic – you’ll see more ambitious manoeuvres in Naples – but it reminds you that Britain’s urban roads are so tightly camera controlled that it’s difficult to use your initiative these days. The driving here isn’t aggressive, but it’s assertively opportunistic and ultimately polite. That’s refreshing. The out-of-town drive to the port is invigorating too. It turns out to be hilly, curvy, mostly smooth and mostly unlit and requires plenty of concentration. Morocco’s night-time drivers seem less press-on than they are in town and we’re able to use the turbo triple’s thrust to get past several cars. You need to rev it a bit, but there’s a decent spread of urge. What we’re wishing for more of is a decent spread of light. That our Sandero’s headlights are configured for right-hand drive in this left- handed country doesn’t help, but they seem to issue the lumens of a Tuareg in-tent lantern. The drive is enjoyable nonetheless. The Sandero has plenty of grip, is predictable, doesn’t roll hugely and, as just discovered, has more muscle than you’d expect. Dynamic finesse is in rather shorter supply. 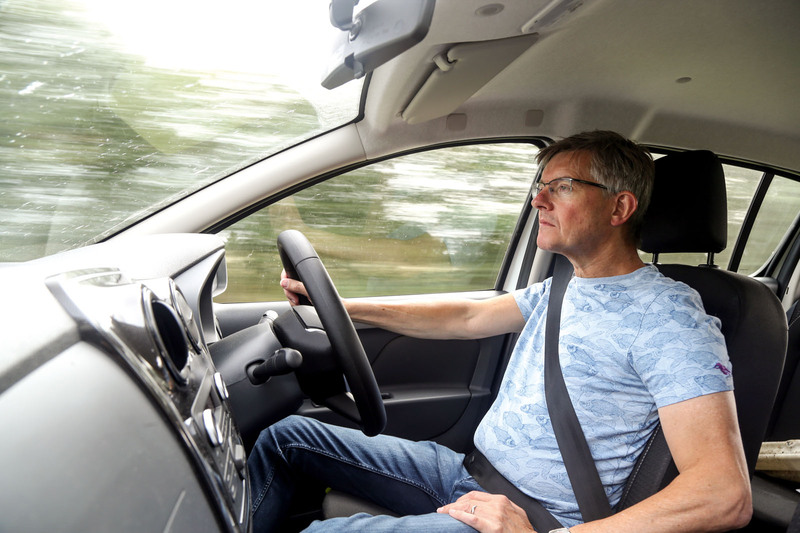 The steering kicks back harshly over potholes, the ride occasionally turns seismic and the car’s reactions to your inputs are no more than spongily obedient. Your reporter has owned a number of budget French hatchbacks from earlier eras – namely a Renault 4, early R5 and Simca 1100 – and driven many more, and all ride and steer with more aplomb than this Sandero. 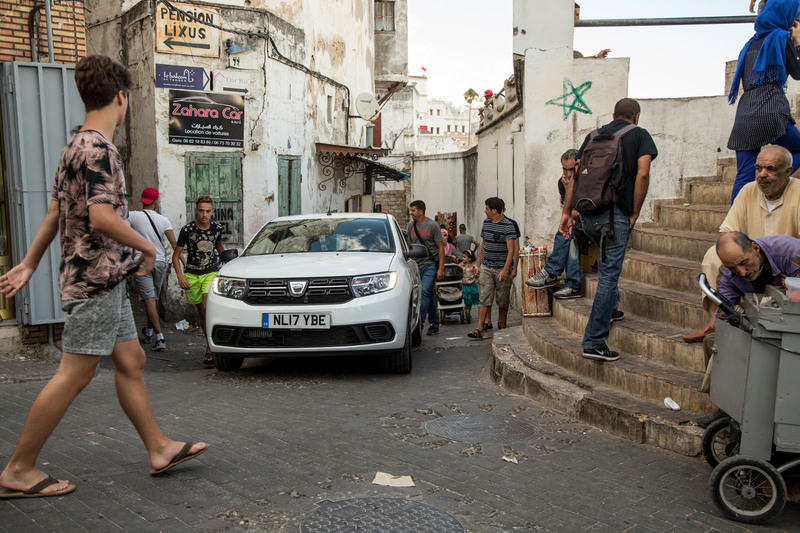 Older Moroccans who remember the once ubiquitous Renault 4 will not be so impressed, even if the Dacia doesn’t behave like a palm tree in a dust storm when presented with a bend. We make the port just in time to check in, a process expedited by fixer number two, Mohammed, and join the queue for the boat. Perhaps predictably, its departure time comes and goes without a white UK-registered Sandero having boarded, Mohammed in conference with several customs officials, his conversations punctuated by phone calls. It’s hard to imagine how the discussion can go on so long. The upshot is that we finally make our Spanish hotel at 5pm and have effectively lost a day. What’s to follow, I’m thinking, will be a slightly wearing slog along the excellent but samey Spanish motorway network, and a similarly lengthy dose in France before we make the Eurotunnel. That said, the scenery through Spain can be pretty diverting, from the combine-harvester-combed fields and reddish earth in the deep south through to the often more rugged, verdant terrain as we head north. It’s amazing how empty much of the countryside looks. 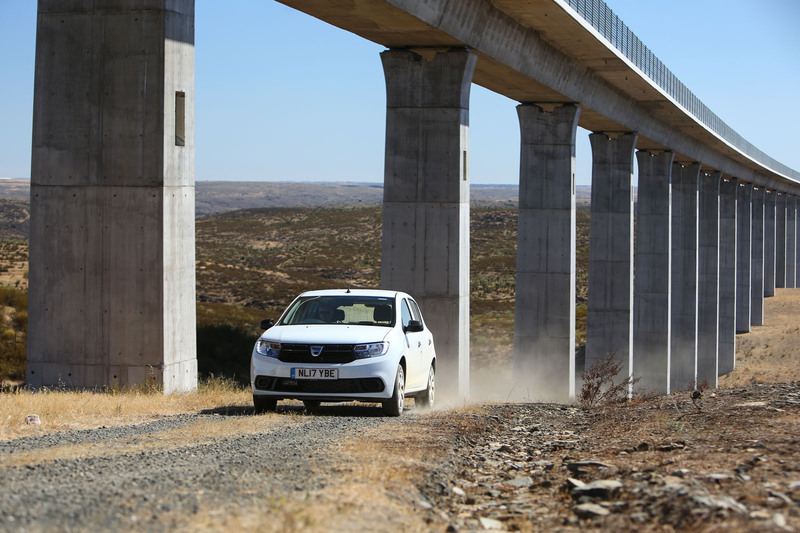 Empty enough that our sighting of a sizeable, brand-new and rather beautiful concrete bridge across a valley prompts us to leave the motorway in an effort to get the Dacia close to it. It’ll make a good photo, reckons Papior, and it dawns on me that this massive edifice is a fine example of no-nonsense engineering with a distinct purpose, just like this Dacia is. Not that we know what the bridge’s purpose actually is. There’s plenty of time to muse on that as we try to get closer along a promising dirt track that turns out to be a dead end. Papior tries Google Maps, which sends us away from the bridge (by now, we’re thinking it could be a huge irrigation viaduct) and away from the motorway too. But not for long. We swing left at a small roundabout and within a couple of hundred metres come upon what appears to be a semi-abandoned village. There are boarded-up houses, crumbling houses, a rather fine old brick and plaster warehouse and, at the end of the road, a lone and rather appealing old crane. It sits on a cobbled platform beside a railway line. This is presumably the one-time goods station of Cañaveral. It’s an intriguingly spooky place, although not entirely unoccupied, the heart of the town some distance from this active but still rather forlorn section of railway. Which has a dirt track running beside it. We head down this, back under the motorway on another false trail before finally getting onto a dirt road taking us to the very foot of the bridge’s fat pillars. The Sandero has the traction and ground clearance for this excursion (the Stepway would presumably be even better) besides feeling robustly rattle-free. Only a section of washboard has the dashboard quivering on its mounts. 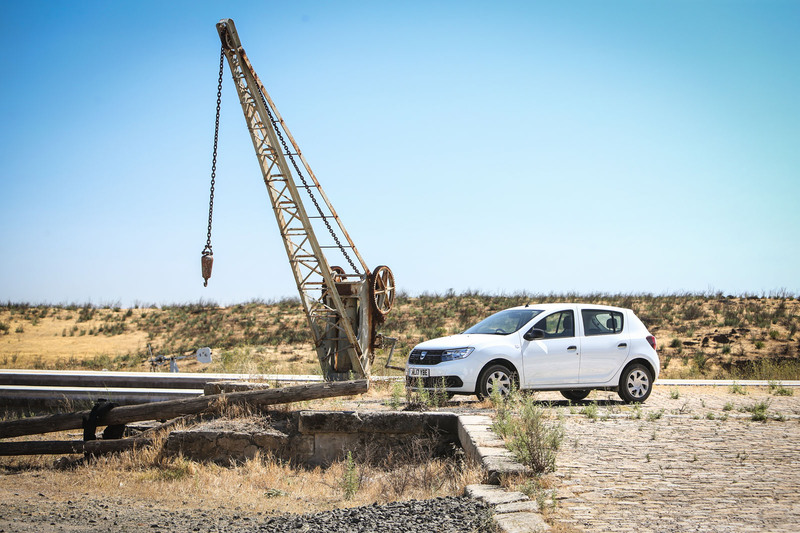 In Morocco, this is the kind of terrain that many a Sandero will deal with daily, and although it could use a more cushioned ride, it’s undoubtedly a high-mileage survivor, as reliability surveys attest. It feels happier on motorways, though, as all cars do. Where we’re surprised to be doing a lot of overtaking. That’s partly because we’re behind schedule, but also because the Sandero turns out to be rather good at cruising. It has five speeds, as you’d expect given its price and the diminutive engine, but that means you’re usually running close to peak puff, making a 120-140km/h pace pretty effortless. It’ll run faster too, but we don’t need a fat euro-denominated speeding fine. Keeping in this speed band could be easier, though, because the speedo’s km/h markings are unreadable. The Sandero would be more effortless still if tyre and wind noise were better quelled but, given the 90 TCe Ambiance’s £7995 price, that can be forgiven – especially as the TCe is not your cheapest Sandero, that being the £5995 Access 75 Sec, with a distinctively less torquey and turbo-less 1.0. The Ambiance provides air conditioning, central locking, electric front windows, a DAB radio with Renault’s excellent behind-wheel controls, Bluetooth and stop-start. Off-road adventures over, we notice rortier tones from the Sandero’s exhaust and, as the miles pile on, there’s more go too, this car not long run-in. The spectacularly picturesque Salamanca is our overnight stop – worth a revisit, but when it’s quieter – and we briefly divert near Bordeaux for a scrapyard visited two months ago on holiday to scavenge more parts for a Citroën AX GT project. A more popular tourist haunt is Nouaillé-Maupertuis, a particularly picturesque ancient abbey village near to our hotel. It’s the site, perhaps inevitably, for some battles involving the British. It’s very quiet now, despite incursions from our Sandero. North of Poitiers, the weather chills, allowing us to kill the air-con. It’s like someone has removed an old sock stuffed down the Sandero’s air intake. The outright performance doesn’t change much, but the way it’s delivered certainly does. When the air-con is battling hot Moroccan air, the throttle is often as responsive as a hard-snoring drunk, and it’s inconsistent too, being affected by the compressor’s activities. Freed of this burden, the engine reacts more keenly, besides revving with zest. Installed in this Dacia at least, the Renault triple isn’t as civilised as Vauxhall and Ford equivalents, but it’s pleasing enough. Indeed, it’s the only element of the Sandero that shows real f lair, 11.1sec to 62mph not bad for budget wheels. On this briskly taken trip, it turns in a very decent 39.5mpg too. 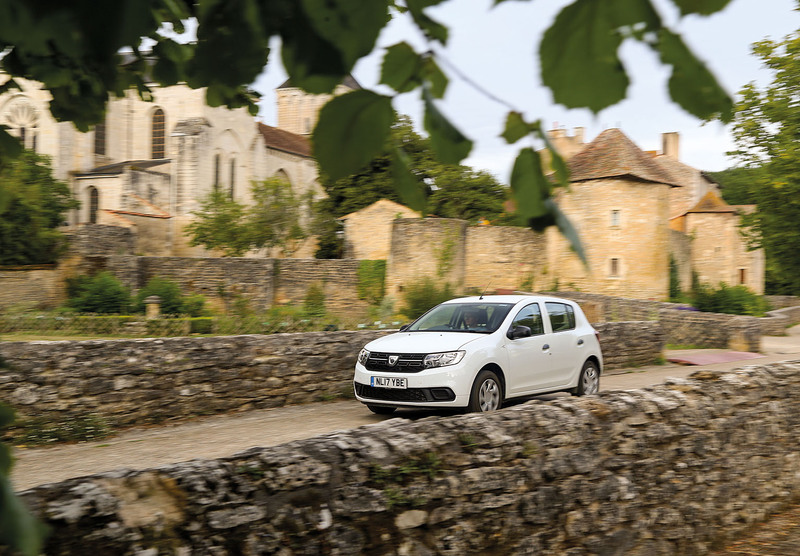 At journey’s end, then, it’s hard not be impressed by the Sandero’s effective functionality, the highlight being that torquey triple, and the relief of air conditioning. Think of the Renault 4s that once peppered Morocco, though, and it’s hard not to want a little more. The French car industry has a long and fine history of producing unexpectedly capable, cheap cars of considerable charm. Sadly, the Sandero isn’t one of them. That doesn’t mean it is cynically produced. Much intellectual effort has been expended on making this roomy, well-equipped and able hatchback available at a low price. And it works, as this journey, the Tangier factory and millions of sales underline. So you receive a harsh jolt when the suspension reaches it's bumpstops. The difference with R4 and R5 was the massive travel their suspension's offered. That however meant both leaned quite inevitably more in corners and quite likely their suspensions probably required few fractions of a secod longer to settle down after a large bump. Aspects that tend to be harshly criticized generally by Autocar testers in recent years. The older French designs had larger travel on softer springs BUT also used purer geometry that retained the contact patch perpendicular to the road. This meant that pushing on despite the body roll gave plenty of grip and still retained bump absorption. If you really wanted higher cornering limits bigger anti roll bars and stronger dampers could be fitted whilst still retaining much of the ride quality and grip. Unfortunately most modern reviews seem to look for a stiff front end suspension before considering handling balances that can offer more with a longer travel setup. Recently the French have dropped the geometric purity from their suspension designs which means shorter travel springs are a necessity to retain desirable road holding at the expense of bump absorption. This may make sense in France where road quality has improved massively but it is more difficult to understand if the cars are still aiming to be sold to countries with poorer roads. That said modern European cars seem able to cope with a surprising amount of punishment from poor roads. Bring back soft French suspensions - we need them in the UK! their suspensions probably required a few fractions of a second longer to settle down after a large bump. They were better than that. I can remember years ago riding in a Renault 16 which leaned into corners but glided along serenely the rest of the time. If you saw one going at speed along a bumpy road you'd see all the wheels frantically pattering up and down while the body stayed absolutely level. I can also remember my uncle inadvertently taking a hump-back bridge in a 5 at what would normally have been far too fast. The car nearly took off but then crouched down on its springs, again staying absolutely level, before rising up to normal ride height in a single beautifully damped motion. They just don't make cars ride like that any more - more's the pity. I'm waiting with interest to read reports on the new suspension that Citroen are touting; if it gets anywhere near to riding like French cars of old, I might just go out and buy one! 'm waiting with interest to read reports on the new suspension that Citroen are touting; if it gets anywhere near to riding like French cars of old, I might just go out and buy one! But never along a gravel road. But heard they rode such roads with good bump absorbsion. To my recall that car had a soft comfortable ride. The unassisted stearing was quite heavy. The low powered engine made it slow to accelerate. But once at speed it cruised ok.
is on the Madrid - Badajoz high speed line, planned to link to Lisbon eventually.